There are few things in the food world that get crazier than the general pumpkin spice craze of October. Most things, in fact, should never be mixed with pumpkin. For starters, pumpkin is actually a pretty bland flavor in my opinion. What most people think of when they think of pumpkin is much stronger spices like cinnamon, nutmeg, and allspice (stuff in pumpkin pie). The truth is that if you just added some pure pumpkin to your latte, you probably would’ve even taste it. 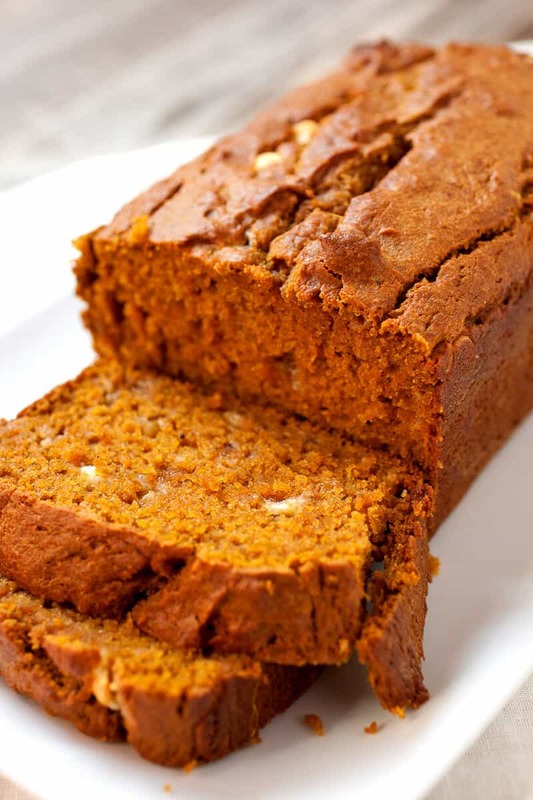 There is one thing that pumpkin is very good at though: adding moisture to baked goods. 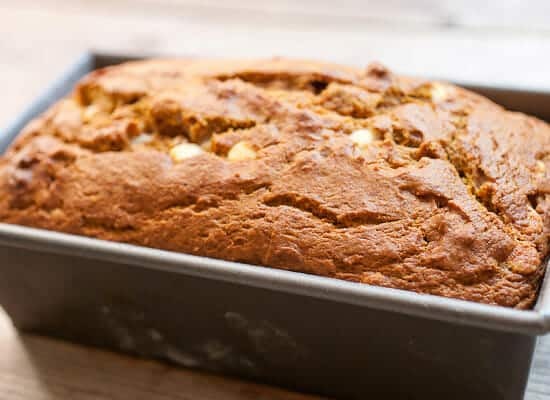 Adding pumpkin to a quick bread like this white chocolate pumpkin loaf is always a good idea. Of course, you’ll want to add more spices and stuff as well, but really I like the pumpkin as a texture addition and not so much as a flavor addition. All of that said, this is far and away the best pumpkin bread I’ve ever made. It’s just dense enough and packed with flavor. 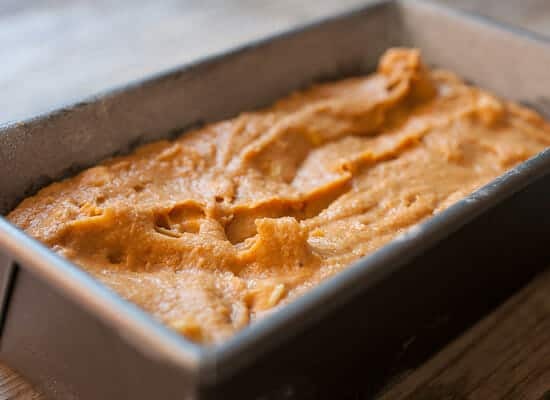 I would normally use butter for a loaf like this but using a combo of melted coconut oil and coconut milk makes the recipe lactose-free (for those keeping track) but also adds a nice subtle coconut flavor to the loaf. Good stuff! Easy and delicious pumpkin bread recipe! 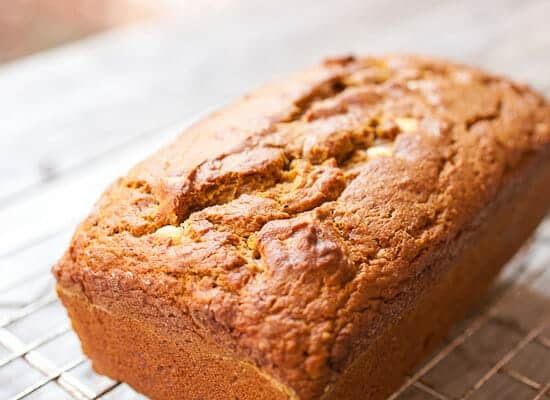 Coconut, white chocolate, and spices makes for a super-moist pumpkin loaf. 1) Preheat oven to 350 degrees F and lightly butter and dust with flour a 9×5 loaf pan. 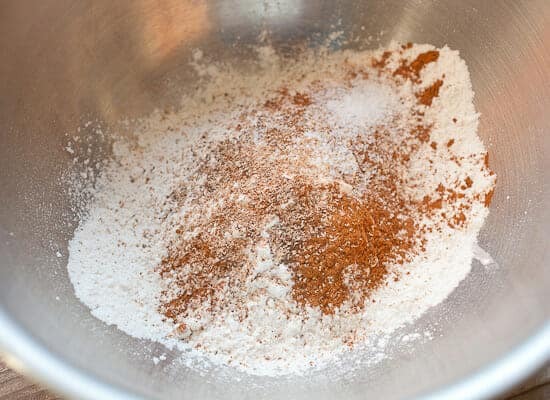 In a large bowl, whisk together flour, cinnamon, nutmeg, allspice, salt, and baking soda. 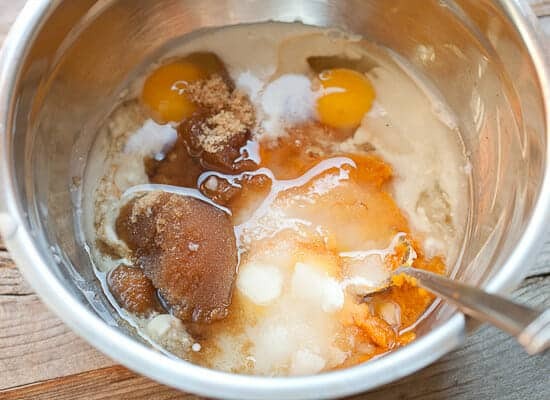 2) In a medium bowl, whisk together sugars, pumpkin, coconut oil, coconut milk, and eggs. Add wet mixture into the dry mixture and stir until just combined. Then fold in white chocolate chips. Try not to overwork the batter and some lumps are okie dokie. 3) Pour batter into prepared loaf pan and bake at 350 degrees F. for 60 minutes. Test center of loaf. A tester (or small knife) should come out clean from the center. It might need another 5-10 minutes in the oven. The loaf should be puffed and cracking on top. 4) Remove from oven and let cool for five minutes. Then remove the loaf from the pan and let cool for another 15-20 minutes before slicing. 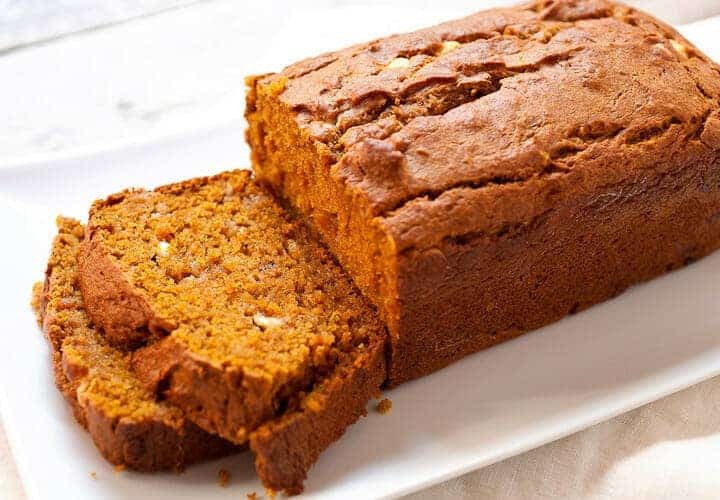 Store pumpkin bread by wrapping it in plastic wrap once it’s completely cool. It will keep for up to a week in the fridge or you can double wrap the loaf tightly and freeze it for up to 3 months. Recipe adapted from a Sally's Baking Addiction recipe. So, for those taking notes, you could substitute butter for coconut oil and milk for coconut milk if you want to use more standard ingredients, but I like these switches. Also, be sure to buy 100% pumpkin and not pumpkin pie filling which has a bunch of additives in it. Also, you can use lite coconut milk or whole fat coconut milk. Mix the dry stuff together in a large bowl. Pretty standard. When stir together the wet ingredients in a separate bowl. This will already start to smell good! Then stir the wet ingredients into the dry stuff until the batter comes together. Try not to over-mix the batter. Some lumps are just fine. Then stir in the white chocolate chips. To be honest, this bread would be good without them, but I like the little studs of chocolate in the final pumpkin bread. Lightly oil/butter a 9×5 baking dish and dust it with flour. Then scoop in all your batter. Bake this loaf for 60-65 minutes at 350 degrees F. The loaf should puff nicely and get crackly on the surface. You’re in business. Let this cool for a few minutes and then slide it out of the pan. Let it cool for another 15 minutes or so before you try to slice into it. I love how the edges on this bread get crispy and crackly, but the interior crumb is so perfect. I was going to send this sucker with Betsy to her office, but then I learned that it actually got better on Day Two. I’m not sure why this is, but giving it a day to sit, wrapped in plastic, rocks. Then I decided I would just keep this one for me. 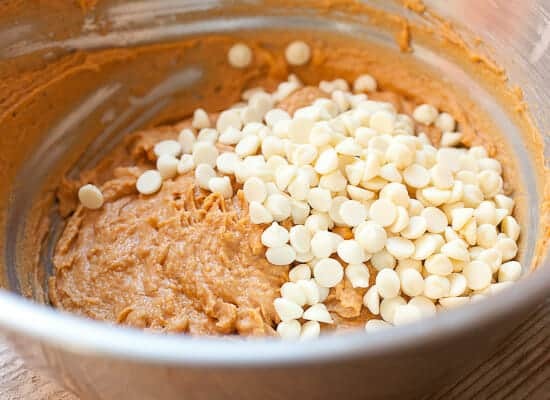 You can skip most of the pumpkin craze this year (like pretty all of these), but do try out this coconut white chocolate pumpkin loaf. It’s a keeper. Looks GREAT! Is there an easy way to print these recipes? Will def. have to try this one out! Love quick breads, love squash, love your site. Going to make this tomorrow, but with butter and milk – using what’s on hand. Also love the way you lay out your site – get to the recipe without having to scroll to the bottom of the page through lots of photos. But I appreciate the instruction photos. If I use butter sted coconut oil (have never seen it in France), can I use coconut milk (that, we can get) or do I have to use milk? 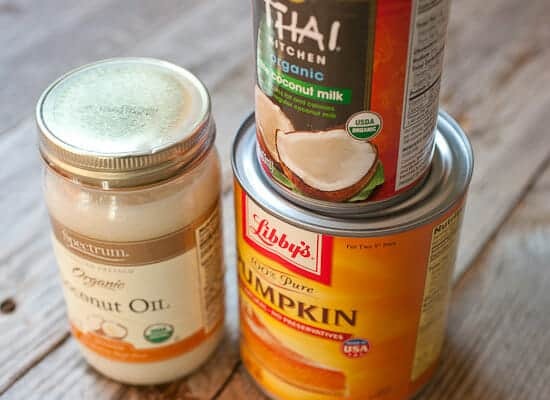 For friends who can’t eat dairy, coconut oil would be great: but, since I can’t get it, is there another oil that I could substitute to keep the loaf non-dairy? Hey Deborah! You could use butter with coconut milk. Shouldn’t be a big deal at all! Or you could just use a neutral oil like sunflower oil or something. Any oil that isn’t flavorful should work fine. I’d stay away from olive oil… Good luck!